DT Customizer is a Mac application, which is currently in beta testing. 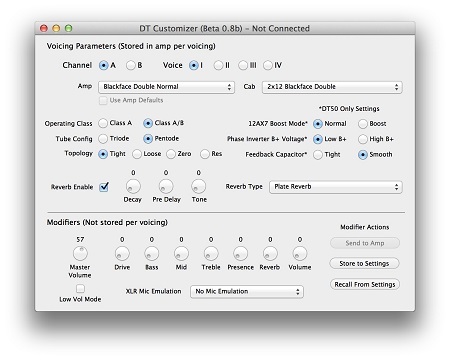 This application gives you an easy way to modify and save DT-Series amp voicing configurations to settings files stored from your Mac computer. You can download the latest beta version here. If you do find it useful, and you want to help keep improvements coming, please consider a donation. Just click the "Donate" button on the right side of the page and contribute any amount. Thanks. Please email your comments, gripes, or suggestions to dtcustomizer@cunningham-photo.com. 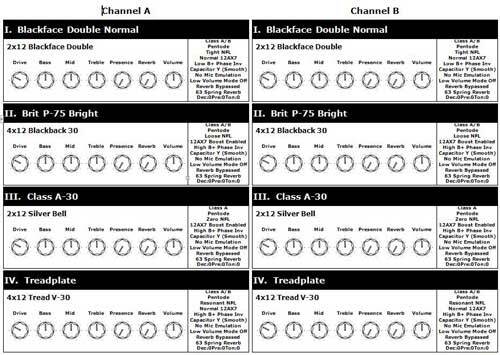 After you setup your amp the way you like it, you can print out a report that looks like the graphic the comes with the DT-Series amp. But, this will have your custom settings.